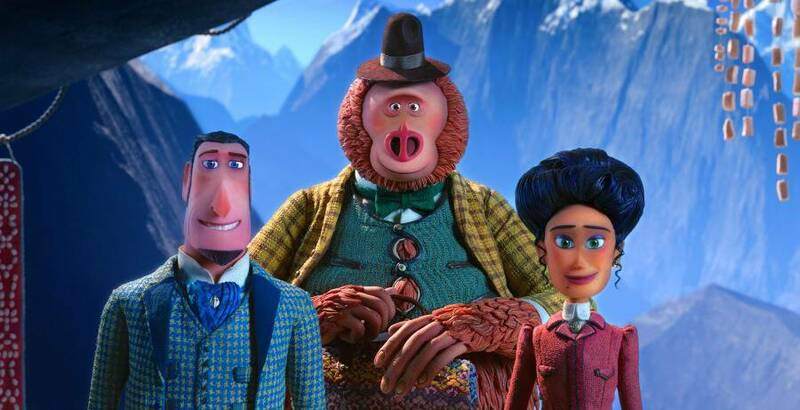 Missing Link is the heartwarming, hilarious family-friendly movie coming to theaters everywhere on March 12. This post is in partnership with United Artists Releasing. You can read my full disclosure policy here. I’ve been looking forward to this movie since I saw the first trailer! 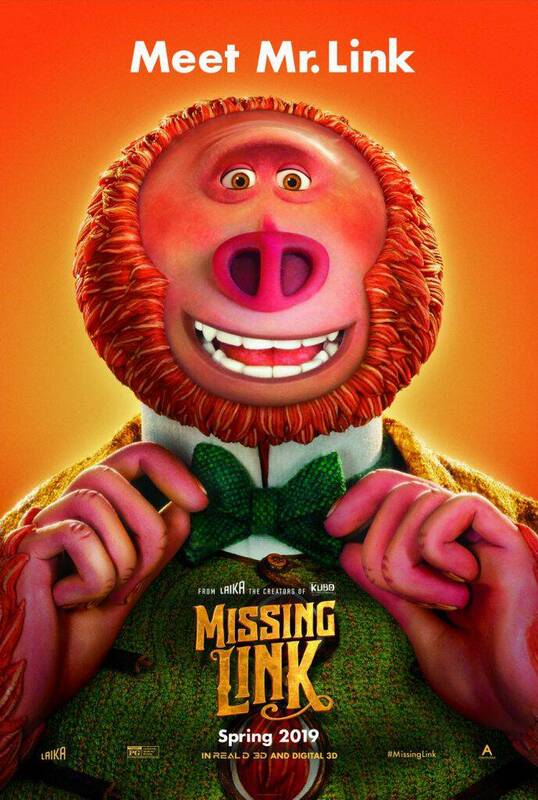 Missing Link is coming out in theaters today, Friday April 12. Cannot WAIT to take the kids! This story is so cute, and it’s such a unique idea. Animal movies are always my favorite and I love the cast. Read on for the trailer, some photos from the film, and an awesome giveaway! Watch the trailer below to melt your heart and make you laugh. Don’t you just love ‘Susan’ already? The all star cast includes Hugh Jackman, Zoe Saldana, Zach Galifianakis, Timothy Olyphant, David Walliams, Emma Thompson, Matt Lucas, Ching Valdes-Aran, Stephen Fry, Amrita Acharia. Written and directed by Chris Butler, I think this movie is going to be SO, so good! The kids will have fun with these free printable Missing Link coloring sheets and activity pages. My son has taken to drawing pictures of each of us in the family and I really need to print this Family Tree page for him! You can learn more about this sweet movie, Missing Link, on the official website, and by following along on their social channels: Facebook | Twitter | Instagram. Ready to go see it? Tickets are available now. Thankfully we only have one soccer game this weekend so I want to get to the theater with the kids to see it, too. The generous folks at United Artists Releasing are sponsoring an awesome giveaway for See Mom Click readers. PLUS a Missing Link prize pack including a Colored pencil set, Mini dry erase board, Puzzle, Sticker set, Drawstring backpack, and Orange socks! Isn’t that the BEST prize?! So fun! This giveaway is open to US residents only, ages 18+. It will close at 11:59pm ET on Monday April 22, 2019. Good luck!! Yes, I have a close friend I consider family; she’s always there for me whenever I need her! I have a friend who has been in my life for years and knows all about me and my family and I consider them family. Yes, I have a friend of 30 years that I consider like a sister. In fact, sometimes friends are closer than blood relatives. We had a family friend that my parents took in, his junior year of high school. He was just one of us. Like a brother to me. My best friend has always been like a sister to me. I had two best friends for many many years that were more like sisters. I love their sense of humor. When I was in high school I had a friend like that. But now we’ve grown apart. I have a friend that I’ve known for about 21 years. They have been through every major life event with me, and all my ups and downs. They are welcome in my home any time, and they are totally like family to me. Yes, my friend from college because we have stayed in touch for 20 years. She is thoughtful and we always have fun together. We have different kinds of friends whom we consider family. They each bring a fresh flavor to our traditions and teach us new things each time. We are all the better for it too! I have neighbors who are friends as well as family that I’ve known for almost 40 years. I don’t have a friend as close as family but I have a couple friends that I see as more than just regular friends. I have a friend who has been in my life for many years and I consider her family. We have very close family friends that we consider family! My best friend I met at church when I was young and for the past 27 years we have kept in touch and I consider her like my own sister! Yes. I have no siblings but met my best friend when I was 7. I’m 54 now so I consider my sister. We have been through everything real sisters would have together. Other than my father whom is my closest friend, my chihuahua connects with me in a way no other person can and I would say that my dog is the closest friend I have next to my dad. I have moved around a lot so I really don’t have a friend like that. My buddy will is my closest friend – we can talk about anything and he never judges me! I have a close friend who I’ve had for over 30 years who I consider to be like a sister to me. I have a couple that I can count on. My best friend and her kids are my family now. My buddy Steve and my buddy Jason. Yes, I have a couple friends that are just like family. I ride motorcycles with friends every weekend and consider many of them closer then family. I have a high school buddy who is like a brother. We can not see each other for a very extended amount of time and catch up like it was yesterday. He has taught me a lot about how to deal with life. Oh yes I have a girlfriend I grew up with, although we live miles apart we are still very close friends just like being sisters. Yes, there are several people that have become part of our family over the years. Nice to have these people in our lives. I have a pretty small family split across the globe, so my friends are truly part of my family. Some most of my life. Several years ago I was struggling as a single mom, finances were hard, car problems, doing it all on my own. My boys started wrestling at school and on a youth team and the coaches, and wrestling families became my family – over the years dads that I didnt even at the time know showed up to give me and the boys rides to tournaments, my boys gained dozens of awesome father figures, we have gone on family vacations together, joint graduation parties, and made friends that will forever be a part of my life. I don’t really have any friends that I am that close to. I don’t really have any friends that close. I have known my friend for 62 years and our families have always been close. She is just like my sister. My late father in law took in a homeless family years ago. The parents didn’t change so we don’t have a lot to do with them. They had a daughter though that is now like a little sister to my husband. We just love her to pieces. Thank you! I consider my ex daughter in law to be family. Regardless of what used to be, she is still like a daughetr to me and the mother of my granddaughter. I used to have a special friend, but after I switched jobs we drifted apart. I have several close friends who I feel like I have always known. What a great story line! SO meaningful and so impactful! I have several friends that I consider like that. Also, my Nana took in many during her life here and treated them better than family! You can make a home anywhere! Yes, have some good friends that are considered family to me. I have several close friends that I consider family, since my family is scattered far and wide. I consider my best friend from high school as familly. As we grow older and become adults, you realize that you now get to pick family…What a joy! It’s wonderful to have friends who are now considered family. I have a friend that I have known since 5th grade. We know each other so well and know our families. She is like a sister to me. Yep, my best friend that I met in middle school! Yes, I have someone who I consider a sister that is no blood relation. Yes, I have a friend that I consider to be family because we have known each other a long time and have been through good and bad times together. Yes we have a handful of friends that we have known since high school that we consider family. We celebrate all the holidays together and our kids consider them Aunts and Uncles! Most of my friends are like family! My big in my sorority has become a sister to me! Thank you. We have a family that we consider our family. Our kids are best friends and we are best friends. They are just amazing people. My close friends are my family. The more friends and family in our lives the better. I do have a friend that I consider to be closer than family. She has been there for me when I’ve been sad, depressed and when I’ve pushed her away. Sometime she knows me better than I know myself and she selflessly helps me whenever I need it. I don’t know what I’d do without her! My best friend since childhood is like family because she’s been with me through thick and thin! yes my best friend Amanda helps me with everything.s he’s amazing! I don’t have a big family. The only person I can think of is my boyfriend. We love all things Disney and the movie Lilo and Stitch, so we say “o’hana” to each other a lot. He is my family. He is one of the only people I trust to no end and he always takes care of me. He puts my needs above my own. I am very grateful to have him in my life. My neighbors are like my family! They are always there when I need a favor, and vice versa! No, we have moved around a lot. We are closest to our own family members. We adopted our little girl, as part of the adoption I had to spend time with her birth family, learning their customs and such. In the end it feels like I got her whole family. We still talk on the phone and send photos and things, they will always be part of our family. I consider one of my best friends as part of the family. She’s like another sister. I have a best friend I’ve known for 31 years. He is like my brother in all but blood. He’d do anything to help me out and same, me for him. He’s gotten me out of different problems over the years and is always there when needed. Yes, we’ve been lucky to find amazing people who are like family to us. I absolutely have friends I consider family. They accept me for who I am, give me encouragement, and are there for me when I need them. I have alot of friends that I consider family. 😉 Known most for 30 plus years. My room mates from college are like family to me because we lived together for 4 years. They are my sisters always. I have a strong community of friends, but I still feel like my family connections are a bit stronger. Yes, my friend from my old workplace. She has even been in my wedding. We still hang out together, and my kids call her auntie. My friend is like family and we have been besties since like the 2nd grade. I have a dear friend who I consider to be my sister we are so close. We have been super close for over 30 years she always remembers me and I always remember her and we live far far away from each other. I do have a friend like that. We’ve had each others backs since highschool….35 years ago. Yes I sure do a lady who lives in the town over from me. She used to work with me. She is an older lady and her husband recently passed away. I have been meeting up with her a good bit for breakfast and we just been chatting. She is just like another Grandma to me. She is just like family and I love her.